Facebook has introduced a new feature called "Trusted Contacts", which lets your friends help you if you’re having trouble logging into your account. You can choose three to five friends to be your trusted contacts. Once you've set up your trusted contacts, if you are having problem to logging in to your Facebook account, your trusted contacts can help you to recover your account. You just need to call your trusted contacts, Facebook sends a security code for your trusted contacts with instructions on how to help you. 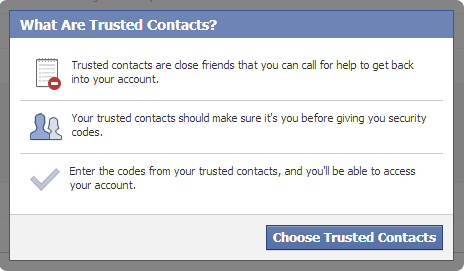 Once you get three security codes from your trusted contacts, you can enter them into Facebook to recover your account. That's all you have successfully added Trusted Contacts to your account. Starting now if you have any trouble in logging in, your trusted contacts will help to recover your account.